EFFORTS ARE BEING made by fans, bookshops and fellow authors to promote Emma Hannigan’s new book and make it a number one bestseller after she announced her cancer is terminal. Bestselling Irish author Emma Hannigan revealed on Friday in a blog post that her long-term battle with breast cancer has become terminal. “My medical team have thrown everything but the kitchen sink at this fight but all avenues have now been exhausted,” Hannigan said. Speaking of her latest book Letters to my Daughters, which was published on 9 February, Hannigan said that she would usually spend the coming days “chatting about it and inevitably daring to wonder if [people] like it”. “This is the time when all authors want to hide in the back of the wardrobe in case nobody likes their new baby. I won’t need to hide, unfortunately, but I sincerely hope you enjoy it,” Hannigan said. These characters were as real to me as all the others. They grew on me and some annoyed me at times, but as always, they were mine. Enjoy them, curl up with some chocolate or some comfort food and a cup or a glass of whatever tickles your fancy. Another bestselling Irish author, Anna McPartlin, has kickstarted a social media campaign to promote Hannigan’s Letters to my Daughter, as she herself is unable to push the book. “Letters to my Daughters by Emma Hannigan is in shops now. Emma can’t promote her work herself so please join us. Buy it. Read it. Promote it,” McPartlin wrote on Twitter. Speaking to TheJournal.ie, McPartlin explained why she made the decision to initiate the campaign. “What’s interesting about the female author community in Ireland is that we’re very supportive of each other. We should be competing against each other but everyone stretches their arms out. We all support one another,” McPartlin said. McPartlin and Hannigan share the same agent, and the pair has met each other on a number of occasions. “[The blog] just struck me and I felt kind of sick,” McPartlin said. “Of course none of us can do anything for Emma but she has a new book baby coming about without her. In her absence, I thought the rest of us should come together, wrap around her and promote her new baby,” she said. It’s her final novel, it’s deeply personal. It means the world to her and we just want to give it the best start. Writer Liz Nugent joined in to further highlight the launch of the book. “As you might know by now, Emma Hannigan is dying after thirteen years of cancer treatment. Her family and friends here and abroad are devastated. Let’s get her book to number one,” Nugent tweeted. Tweets from McParlin, Nugent and other Irish authors have received widespread engagement from social media users. And furthering the social media movement, Dubray Books has announced that it will donate all profits from Letters to my Daughters to the Breast Cancer Ireland charity, of which Hannigan is an ambassador. Speaking to TheJournal.ie about its decision to donate its profits from the book, managing director of Dubray Books Maria Dickenson said: “We were wracking our minds to figure out how we could help, and so we decided on this. Emma is absolutely beloved in the trade. She’s a wonderful writer first and foremost and she’s a wonderful person. She’s kind to all, she’s kind to bookshops, and she’s a delight to know. Dickenson said there has been a “phenomenal response” to the announcement that all proceeds will be donated to charity. “Everyone has been so touched. The phone has been hopping since we made the announcement,” she said. Dickenson said that the book has gone into reprint and that Dubray Books has ensured it has enough stock to meet the demand. A spokesperson for Eason said that the store has seen an increase in sales of the book over the past few days. Aisling Hurley, CEO of Breast Cancer Ireland confirmed that funds donated from profits made on Hannigan’s book will fund pioneering research into breast cancer at its labs. 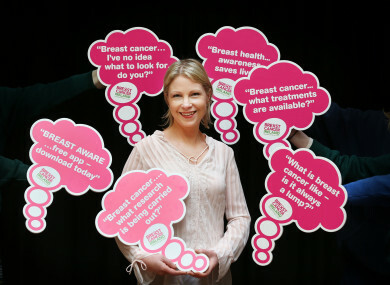 “We were all heartbroken to hear the news of our great friend and valued ambassador Emma Hannigan. We promise that we will continue working hard to help make a difference,” Hurley said. Hachette Ireland, Hannigan’s publisher, issued a statement to TheJournal.ie regarding the reaction Emma’s blog post has received. Emma has always felt a very special connection to her wide and dedicated community of readers, and has been very grateful for their support for her wonderful novels over the years. The response to her heartbreaking post last week has been very touching, and we join Emma in her request that anyone wishing to offer support can pledge a donation to Breast Cancer Ireland. Hannigan opened up in her blog post about her final days and the love she shares with her family, friends and supporters. “Faced with very little time, can I tell you what screams out to me? Love,” Hannigan said. “Nothing else has much meaning anymore. Just the love I feel for the people I hold dear,” she said. “Life is so very precious. We never know the day or hour that it will be whipped away. So fill your days with as much happiness as you can muster. I am broken-hearted at having to say goodbye, so if it’s alright we’ll say farewell instead. Email “Writers join together to push Irish author's new book to top spot after terminal diagnosis”. Feedback on “Writers join together to push Irish author's new book to top spot after terminal diagnosis”.